Start building a strong foundation for math and reading by introducing sequencing skills to your preschoolers. 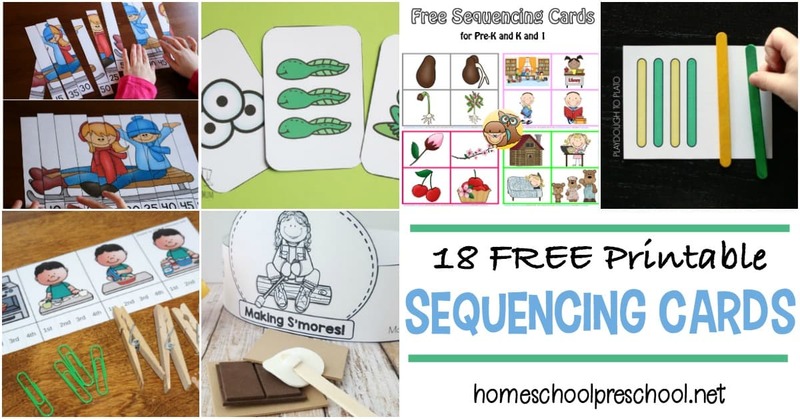 These free printable sequencing cards will get you started. 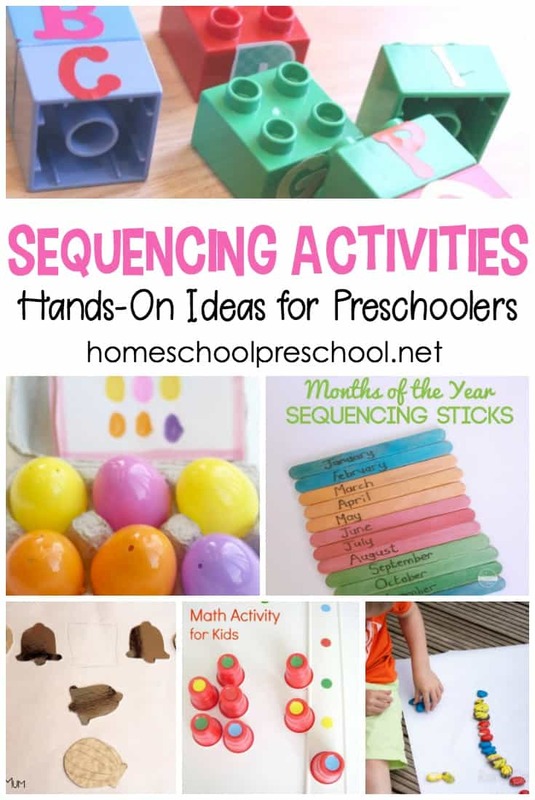 I’ve enjoyed sharing sequencing activities for preschoolers. 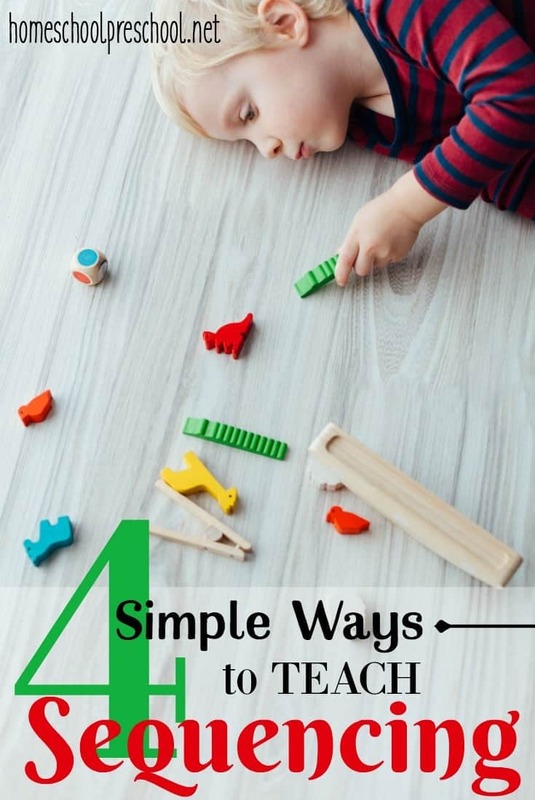 They are so important for helping little ones learn to make order of the world around them. Sequencing is also a building block for early math and literacy skills. 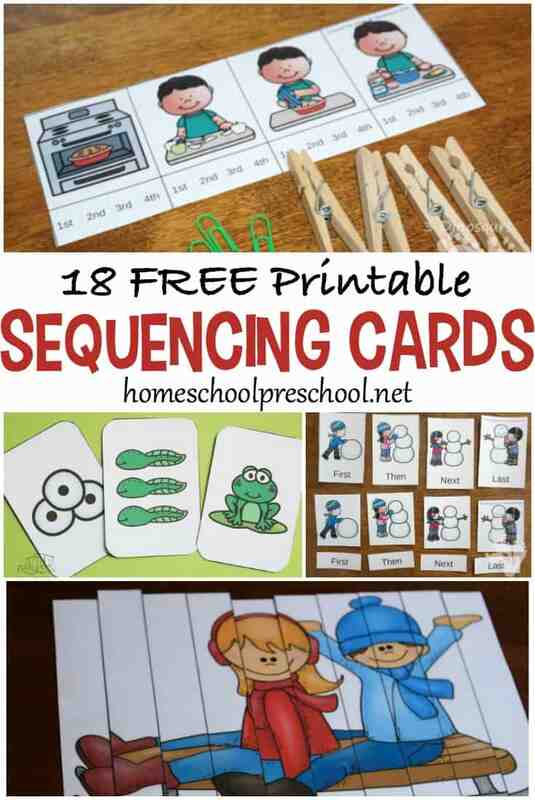 These free printable sequencing cards are a great way to let preschoolers practice sequencing activities they are already familiar with. Kids will begin to make sense of the order in which events happen when you introduce these free printable sequencing cards for kids. Your little sports fans will love this free mini-baseball themed sequencing set. In it, you’ll find clip cards and a writing page for kids to record the sequence. 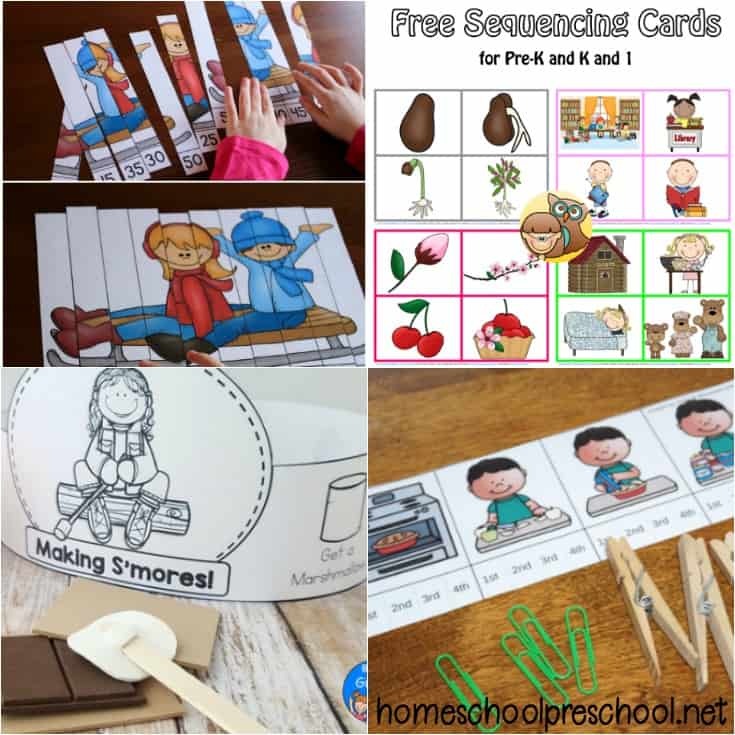 This set of free sequencing worksheets covers 15 topics which include personal hygiene and seasonal activities. Not only can your kids put these frog life cycle cards in order, you can print multiple copies to turn them into a fun memory matching game. This mini-nativity themed sequencing set is perfect for the holidays. Kids can put the cards in order, mark the order on the clip cards, and then write the sequence on the writing page. Nothing says summer like a s’more! Your kids will love this s’mores sequencing crown. Then, be sure to check out her pretend play s’mores props. They’re so cute! If you’re studying plants and/or seeds in your preschool, be sure to download these plant sequencing cards. They’re a great addition to your science activities. I love that this set of snowman sequencing cards uses the words first, then, next, and last in addition to using ordinal numbers. Autumn is the perfect time of year to practice sequencing how to make an apple pie. Kids can practice counting to ten as they put these “ducks in a row” sequencing cards in order from 1 to 10. After reading about the life cycle of an apple, let the kids put these life cycle cards in order on a sheet of construction paper. 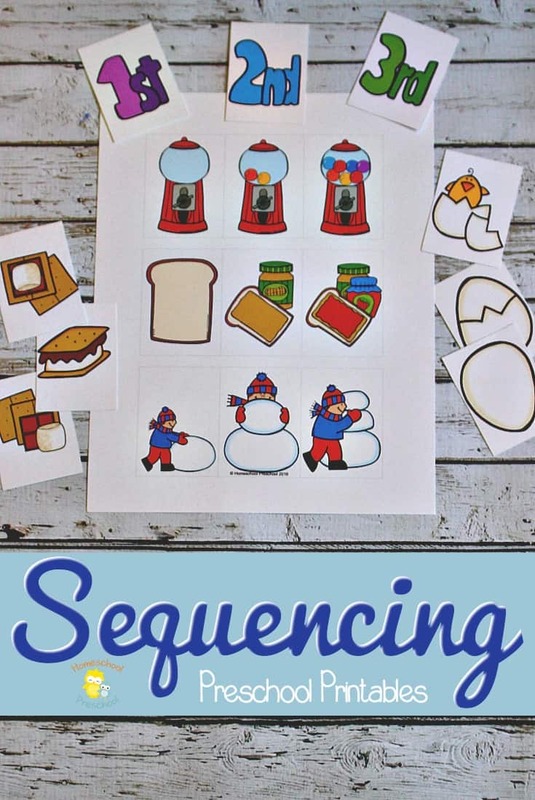 In this free W is for Winter learning packet, you’ll find a fun set of snowman sequencing cards. If you’re looking for a fun game for your kids to play this Christmas, try out these fun Christmas story sequencing cards. This life cycle sequencing card bundle contains cards for chickens, dogs, snakes, fish, frogs, and several insects. These caterpillar sequencing cards will help preschoolers learn to recognize patterns and understand how evens occur in a specific order. Skip counting puzzles help kids practice number order. These puzzles will hep kids practice skip counting by 1, 2, 5, and 10. Patterning is another way to practice sequencing as kids try to determine what comes next based on the pattern provided. This popsicle stick pattern cards bundle contains 12 cards for kids to practice with. Here’s another fun set of pattern strips for kids. These bear counter pattern strips are designed to be used with rainbow bear counters. You can grab some rainbow bears of your own if you don’t have any on hand. Free printable sequencing cards will help you begin to build a strong foundation for logical thinking with your preschoolers. Which ones will you try first? Thank you for gathering these resources!! I loved looking through all the options for freebie downloads! I’m reviewing sequencing this week with my kinderclass and I’m excited to use a few of these! !